Raymond Wendel Anslinger, 86, of Savannah, MO formerly of Atchison, KS, and Wichita, KS passed away Thursday, February 7, 2019, at LaVerna Senior Living, Savannah, MO. Funeral service will be 11:00 AM Tuesday, February 12, 2019 at the Becker-Dyer-Stanton Funeral Home, Atchison, KS, with Rev. Michael Strickland officiating. Family will receive friends prior to the service from 10:00 AM to 11:00 AM at the funeral home. Burial will be at 2:00 PM, Wednesday, February 13, 2019, at Lakeview Cemetery, Wichita, KS. Memorials are suggested to Michael J. Fox Foundation for Parkinson’s Research and may be sent in care of the funeral home. 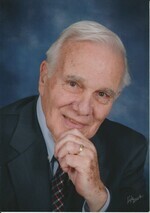 Online condolences may be left at www.beckerdyer.com. Raymond was born August 21, 1932 in Atchison, KS, the son of Albert Anton and Lillian Mae (Hines) Anslinger. He graduated from Atchison High School in 1950, attended Washburn University, and then Wichita State University earning a BA in Education and then a Masters. Raymond served in the United States Army earning the rank of Major and in the Army Reserve earning the rank of Command Sergeant Major. He earned the Bronze Star, Meritorious Service Medal, and many other medals in his thirty-five years of military service. Raymond was a member of The American Legion (Unit Commander), AHS Golden Grads, American Society of Training Directors (Past President), and the Association of US Army. He enjoyed bowling, fishing, hunting, crossword puzzles, RVing, and gardening. Raymond married Erma Jean Ryan; she preceded him in death on October 17, 1990. He married Lila Ellen Cowley on February 15, 1992 in Savannah, MO, she survives of the home. Additional survivors include his daughters, Sheri (Dallas) Wolfe, Memphis, TN, Janet (Kevin) Crouch, Augusta, KS, and Wendi Turner, Andover, KS, his sister Linda (Danny) Garner, Haysville, KS, eight grandchildren, and three great grandchildren. He was also preceded in death by his parents and his infant son, Mark Anslinger.